At Varsity Driving Academy we offer a 30 Hour Online Drivers Education Course that is approved by the California Department of Motor Vehicles. Our information covered in the course along with the California 2014 Driver Handbook will assist the student in gathering the knowledge needed in order to take and pass the written version of the California DMV test. It’s easy, just simply hit the Register button on the website to enroll, or give Varsity Driving Academy a call at our office to register over the phone and begin your course immediately. When you choose Varsity Driving Academy for your online drivers education, you are working with Orange County’s leader in driver training. When you register with us, you can choose a username and password for your account to gain access to the site 24/7. Our driver training course is divided into 11 chapters that provide video interaction and instruction as well as video clips that demonstrate the proper technique and rules of the road. As you finish each of the chapters, you will be prompted to take a short quiz that will test the knowledge that you have obtained from that chapter. After you pass the quiz you will be able to see your score. If you happened to fail the quiz you will be able to go back and read over the material and retake the quiz. Your test scores are saved on your account and you are advanced to the next chapter after you have passed. 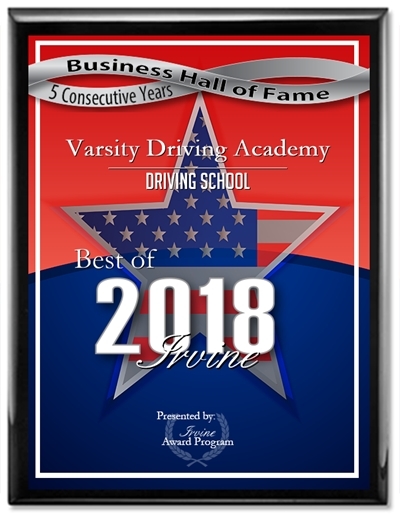 Once you have successfully completed the online drivers education training course, Varsity Driving Academy will provide you will an original certificate of completion for you to present to the DMV. Your fee for the drivers education course includes the 30 hour course and the completion certificate. At Varsity Driving Academy we have created our online drivers education course to be convenient, intuitive and interesting to follow. We know that you have many choices when it comes to choosing where to pursue your drivers training, so to ensure that you get the best possible education and training we have spent the time and research testing our methods. This way, our students enjoy the process of learning how to drive and are comfortable every step of the way. So sign-up today and get the expert driver education training that you are looking for at Varsity Driving Academy in Orange County. If you have any questions or require assistance,you may contact us by phone or email. Thanks for choosing Varsity Driving Academy for your driver education class. We hope you will enjoy yourself while learning! When you complete the course you will receive a Certificate of Completion, which allows you to take the learners permit and driver exam license at the DMV.